I have been soaking this old lace for two days. It came out really nice. All will now reside in my crafting room and be used for projects. Except maybe the filet angel square. It looks almost presentable now, so might be worth preserving. The chemical lace in the front is a really nice imitation of Irish crochet. It is in many pieces and has been altered a few times. 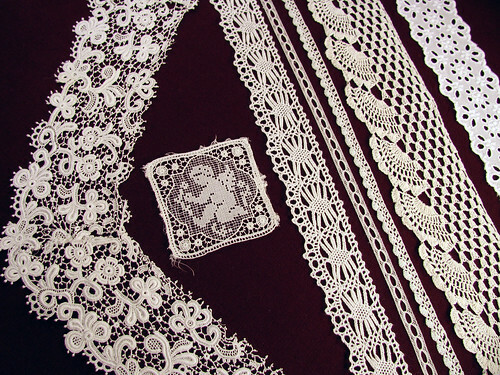 I am thinking I will cut out the motifs for some crazy quilting, There are two yards of the 1920’s lace next to the angel, enough for something major. The next lace is a bobbin lace and next to that is a narrow crochet lace. That is made by crocheting both sides of a looped machine made trim. It was two tone before washing, the inner trim having turned quite brown. It gives me the idea to look for trim I can crochet shells onto for a new version of this design. The wide crochet trim I am going to put on a tablecloth for my kitchen table for that cottage look. It is really sturdy and I have no idea how old it is. There is enough for a 60 inch round table cloth. The eyelet isn’t anything special, but it washed out nice and there are a couple of yards. I am sure I can find a new project for it. Today I am soaking some more ornate antique lace. I still have quite a bit to decide what to do with, one piece at a time. I am so thankful for this blog. It has been a great motivator to go though the cedar chest, rather than just putting things on top of it. This entry was posted on Friday, March 27th, 2009 at 3:00 am and is filed under Lace and Vintage. Tagged: Craft, Lace, Vintage. You can feed this entry. You can leave a response, or trackback from your own site. What a fascinating blog! Thanks for sharing the beautiful photos. OMGoodness! That lace turned out beautiful all washed and crisp looking!